I can’t name a single time where my husband and I didn’t order spinach artichoke dip whenever we went to a restaurant. While some served more processed versions than others, I can’t also can’t name a single time where we were ever disappointed with it. So when we started eating clean, we weren’t sure that we would EVER be able to eat it again. I happened upon FoodNetwork.com, where I saw a pretty detailed recipe for my long-lost favorite. I hadn’t had it in a very long time, so my mouth instantly started watering. I knew I had to try it out. I ended up doing a version of a spinach artichoke melt (I had gotten the idea from Pinterest, big surprise right?) on organic sourdough. I felt that the combination would be balanced and the flavors would meld together quite nicely. I, of course, made a few tweaks that I felt would benefit the mixture moreso than the original recipe. Let me know what you think! 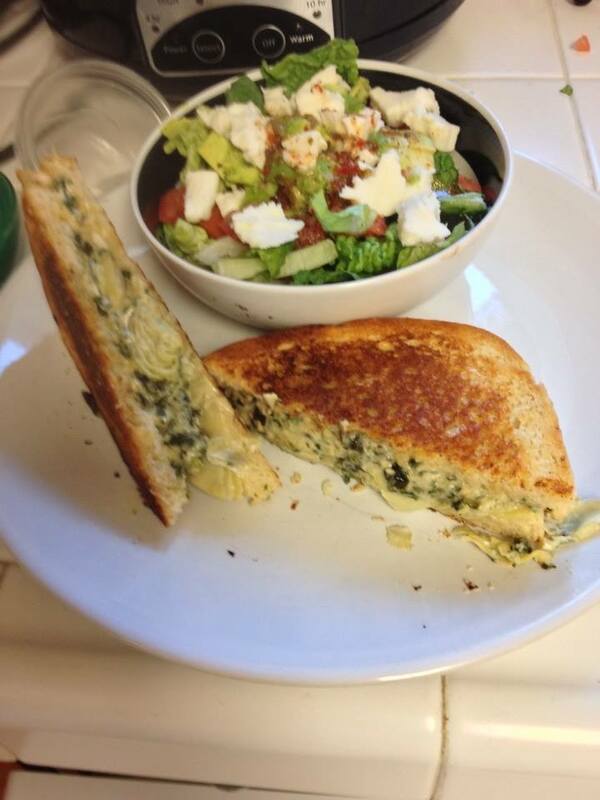 Spinach artichoke melt, shown with a side salad of romaine lettuce, fresh mozzarella, avocado, and rustic Italian dressing (Wild Harvest Organic). 1 cup artichoke hearts* (I used frozen and thawed them out, but jarred ones also work). 1/2 cup fresh grated Parmesan cheese (please don’t use Kraft or similar, as it will not melt right). Melt butter in large saucepan over medium heat. Throw in the garlic, salt, and pepper and saute for a minute. Add flour and whisk constantly, allowing the flour to cook off for another minute. Whisk in milk, taking care to pour slowly and allow the mixture to thicken. After the mixture has thickened to a paste-like consistency, remove from heat. Add in lemon juice, sour cream, white sharp cheddar and Parmesan cheeses. Whisk until cheeses are nearly all the way melted. Put mixture back onto the heat to melt the rest of the cheese, and add in spinach and artichoke hearts. Cook for an additional couple of minutes, allowing the spinach to wilt and the artichoke hearts to become tender. Serve immediately! Serves 6-8 people. Serving suggestions: Serve as dip with chips, veggies, crackers, or bread. You can also serve this yummy dip in a glorified version of a grilled cheese sandwich (pictured above). But most important, make sure to serve it however you will most enjoy it! In the words of my late grandmother, mangia!